projects in your day-to-day practice and activities. Learn about typical space allowances for small, medium and large libraries. Learn about the five core functional areas in libraries. Learn typical site size, configuration and orientation requirements. 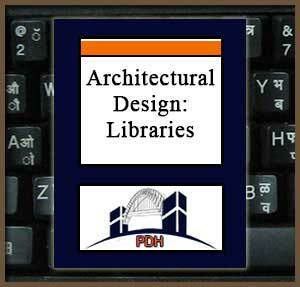 Learn about architectural criteria for the circulation desk, circulation spaces, general collection stacks, reference desk, reference collections, and on-line public access catalog (OPAC) computer stations. Learn design basics for microform viewing stations, small group study areas, display/bulletin board areas, reproduction areas, and fax/scanning areas. Learn about information service areas including computer workstation areas, computer labs, equipment, and related infrastructure, as required. Learn how to provide a local area network (LAN) room for servers, wiring, backups, homepage administration, virtual out processing, and report generation. Learn the basic features of children’s areas including computer workstations, toys developmentally appropriate for children, special reading collections, A/V materials and listening stations, and areas for group activities, such as storytelling or reading programs. Learn how the Americans with Disabilities Act Architectural Guidelines will affect the construction, additions, and renovation of existing facilities. Learn how to incorporate sustainability principles in your design, such as renewable energy, daylighting, passive and active solar heating, natural ventilation, and photovoltaics. Learn how to incorporate outdoor reading areas, patios, furniture, and other outdoor amenities into your design. Learn techniques for effectively incorporating book and audio/visual (A/V) collection boxes into a library. Learn parameters required for service vehicles and service access areas. Learn the basics of building organization and circulation.